This handmade creation is offered in partnership with NOVICA, in association with National Geographic. 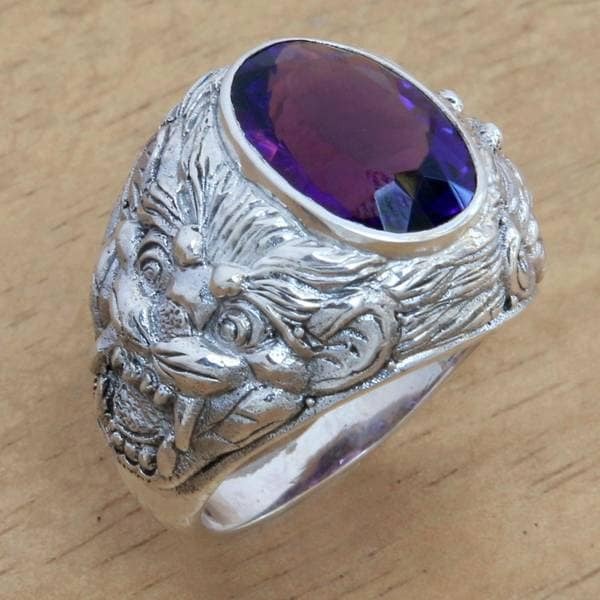 Barong appears in this sterling silver men's ring by Nyoman Rena. In the center is a three-carat faceted amethyst. Also known as Bhoma, Barong represents the goodness that destroyed the evil Rangda. Making use of his carving ability, Rena combines it with his silver work. Nyoman Rena was born on October 11 as the third of five children. His father is Made Beratha and his mother is Ketut Sukarti. Young Rena started to learn wood carving when he was in the third year of elementary school. His grandfather, an architect of traditional Balinese buildings who is also a senior carver, gave much support to Rena's carving and jewelry development. All weights and measurements are approximate and may vary slightly from the listed information. Treatment code H (amethyst). See Gemstone Treatments for further information. Dimensions 0.8 In. X 0.8 In. X 0.3 In. This item is beyond words, but I'll try. Nice weight, beautiful stone(color &size are perfect). The Artisan Collection from Nat. Geo, is amazing. I have 2 pieces from this artiest. This item will bring a compliment or two. Beautiful ring. Very nice color stone and unique design.